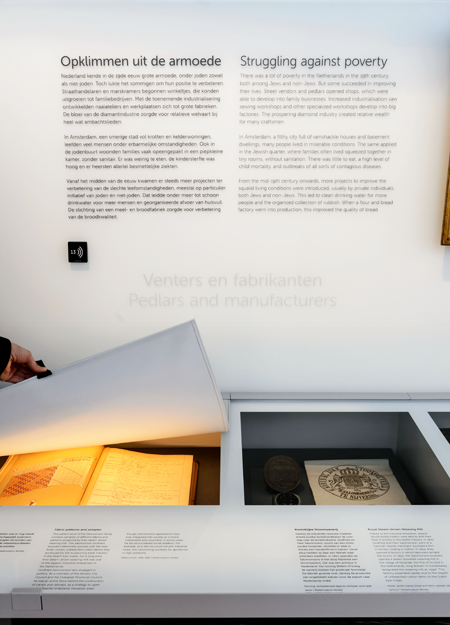 During the course of 2016 and 2017, Studio OTW worked together with partners Atelier Alkema and Bloemendaal & Dekkers on the refurbishment of a part of the permanent exhibition in the Jewish Historical Museum in Amsterdam. 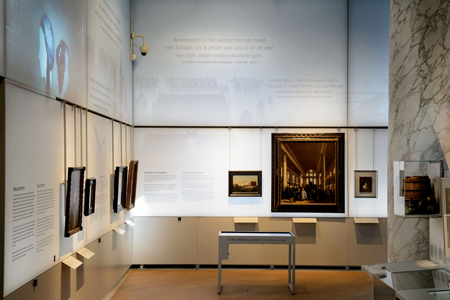 The gallery displaying the history of Jews in the Netherlands from 1600 to 1900 is situated in a magnificent yet unconventional exhibition space of the Great Synagogue. 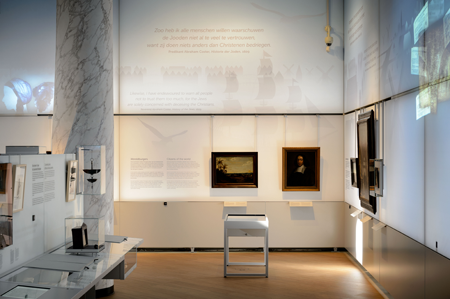 Together with the complex narrative covering three centuries of migration, settlement and citizenship, the exhibition design also addresses the architectural challenges of this unique location. 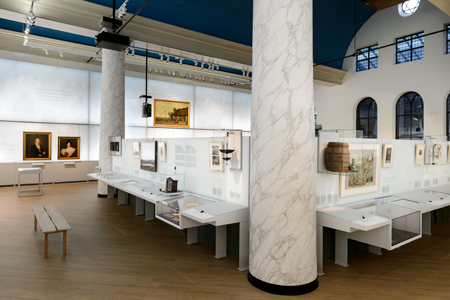 The daylight that used to flood the gallery is filtered through translucent wall revealing just enough of the original rhythm of the meters-high windows to suggest the architecture and the world beyond the gallery. 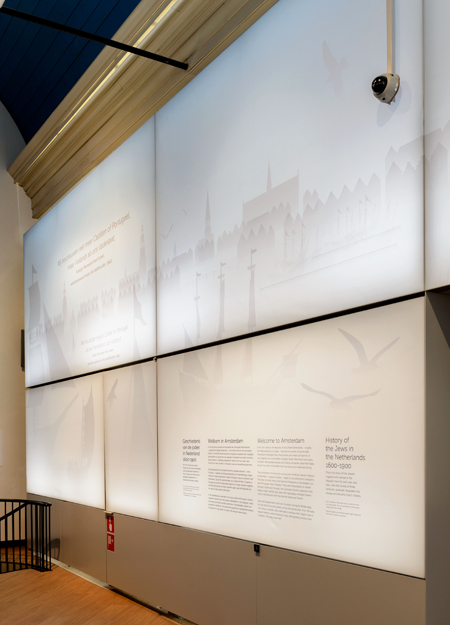 This ephemeral skin holds the general historic narrative encapsulated in evocative graphics and dotted with personal histories. 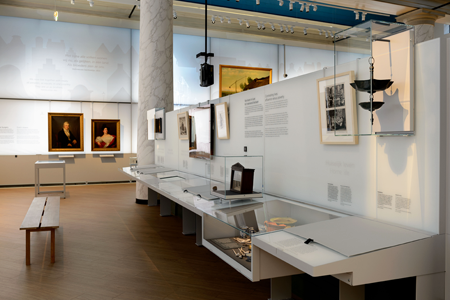 In the center of the gallery, situated on the perimeter of the void, a line of showcases exhibits a treasury of carefully selected objects making the history tangible. 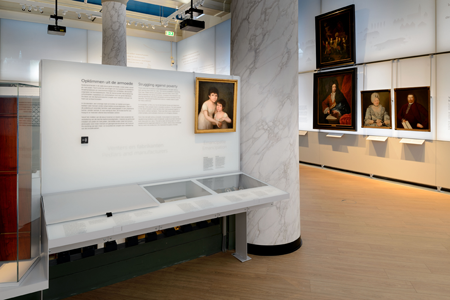 The scale of these lectern-top showcases allows the visitor to closely engage with the collection pieces. 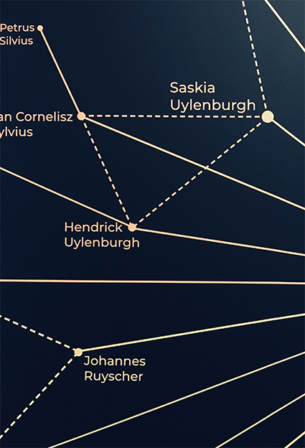 In contrast to the readily available narrative on the outer perimeter, the stories in the center core ought to be discovered. The visitor moves freely between a general and a personal history thread. 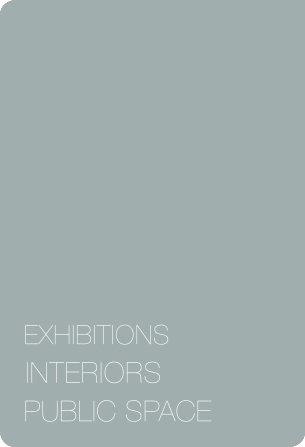 A collection of whites, matte and glossy surfaces and various grades of transparency give the gallery a serene, contemporary character. 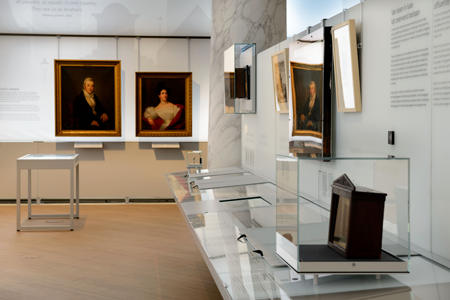 In addition, the light – natural and artificial – enhances the atmosphere of a time capsule basking in a warm glow. © 2018 Studio OTW. All Rights Reserved.